A YouTube video in which someone compares an iPhone 4S alongside a purported iPhone 5 has reached over a million views in a single day. The camera footage, which could still stand to be the most elaborate iPhone 5 hoax yet, expositions a thinner phone with a larger display, mini-dock connector and bottom-positioned audio input. These details jibe with the many rumors we've been hearing for the past several months concerning the design of Apple's upcoming phone which is expected to be announced on September 12. The Next Web claims that the originators of this video "accidentally found" an iPhone 5 at Foxconn's Jincheng facility, presumably the birth place of many more phones just like this one. "Accident" in this case is likely shorthand for "intentional misappropriation of goods", but few details are known. Somewhat comically, thanks to the plethora of iPhone 5 rumors and potential leaks, Chinese company GooPhone has patented a design which is expected to be identical to the iPhone 5. GooPhone says it will protect its Chinese patent aggressively, possibly suing Apple if it releases its latest smartphone within China's jurisdiction. The GooPhone i5 faithfully imitates purported design leaks and was patented and released before the iPhone 5 was announced, giving GooPhone a possible legal advantage over Apple in China. Of course, all of that depends on the accuracy of said rumors and leaks. 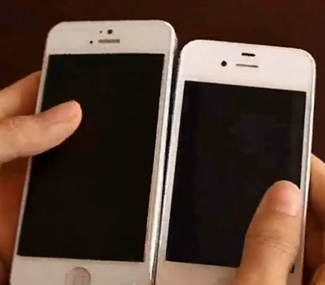 The video shows the 4S and 5 side by side, revealing a new, larger smartphone without a metal edge and an extra pin-hole near the front-facing camera. It also demonstrates both devices booting up together into iOS. As convincing as this video may seem, the public still can't be certain about what Apple's new smartphone will look like until it is officially unveiled. Maintaining a healthy amount of skepticism is highly recommended.